A Pastor with the MFM ministries, Wale Solomon is currently clinging to life in an undisclosed hospital in Lagos after he was allegedly attacked by some members of the notorious killer cult, Badoo on Saturday. The victim was attacked at his family house on Obayemi street in First Gate area of Ikorodu around 2am on Saturday. The cultists smashed his head with a big mortar and injured him in different parts of his body before his cry of pain awoke his wife who ran out of the house to call for help. 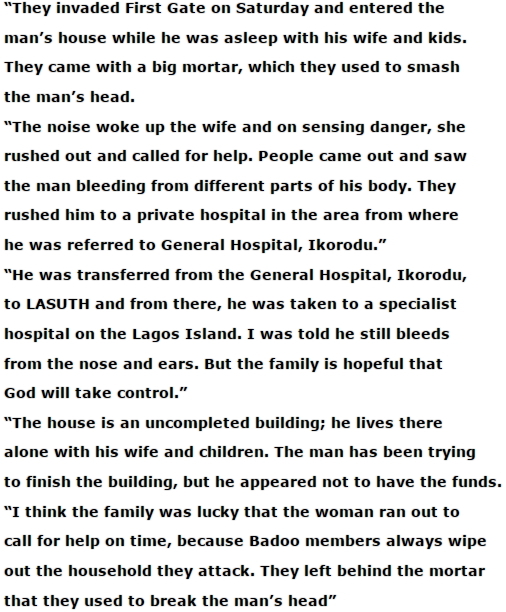 Some neighbours reportedly ran to the house and found the victim in a pool of blood with the mortar the cultists used by his side. The victim was rushed to the hospital from where he was referred to LASUTH. He has since been taken to a specialist hospital on the island where he is responding to treatment. Hmm, thank God he will survive. This group of animals shall be visited by the wrath of God soon. Every troubler of the Israel of Ikorodu shall be visited by the wrath of God. The height of insecurity seen in ikorodu area of lagos state in recent years is such that is completely unprecedented and a major worry for the commuters dwelling in that region. Human lives no longer count to people anymore. 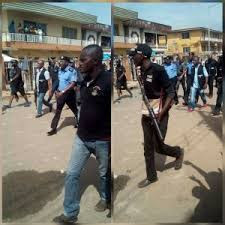 This incessant and recurrent act of terror inflicted on innocent lives by the so called badoo cultists has actually exposed the loophole,limitation and the vulnerability of lagos state security apparatus. Lagos state government has to redouble their effort and step up their fight against this blood thirsty individuals so that families dwelling in that part of the state can have full security coverages and live in peace and not in pieces. we tank God 4 spearin his life.how many of dem do use 2 attack a family. we tank God 4 sperin his life.how many of dem use 2 attack a family.